From corporate holiday parties to winter weddings, the season of celebration is upon us and we’re so very excited (can you tell we love hosting?)! Everything comes together this time of year in shiny gem colors and vibrant metallic tones and it’s our absolute favorite thing to see. No surprise then that we’re completely obsessed with this Christopher Marcs Design styled shoot, full of hot pinks and purple for us to gush over! 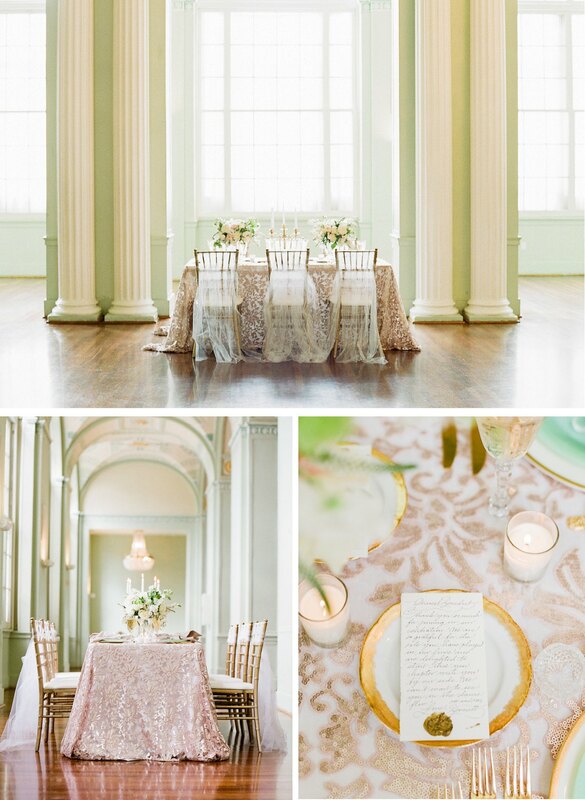 Biltmore Ballrooms in Atlanta played the perfect setting for this brilliant design. 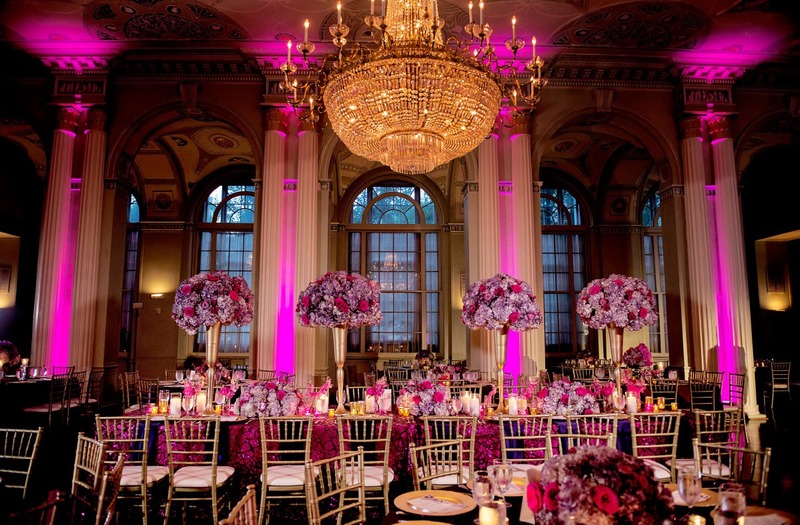 The room was lit up in pink- hued up lighting that accented the statuesque columns and crystal chandeliers – a real dream of a venue! 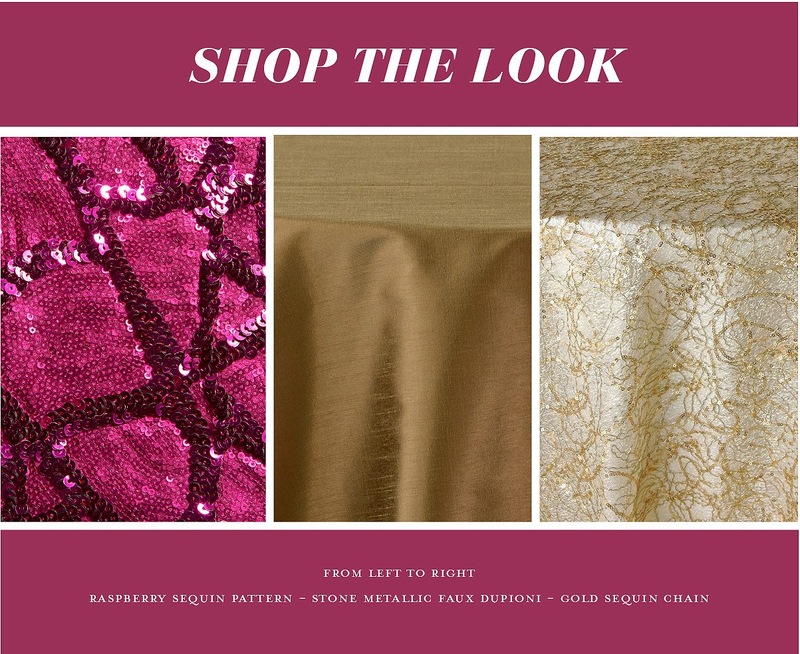 Marcs Design dressed it with our Raspberry Sequin Pattern linen. Combining bold fuchsia and a geometric pattern of sequins, this linen really shines! 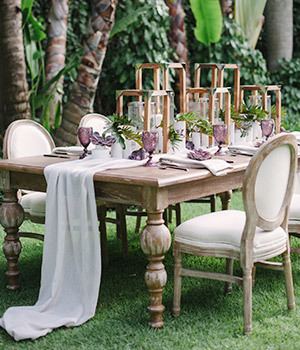 We love how the tabletop brought in ombre shades of purple in the florals and bright accents of gold on the tableware. The look was completely refined and brought a ton of fun to the party! And of course, a sweetheart table fit for royalty graced the stage dressed in our Gold Sequin Chain overlay. 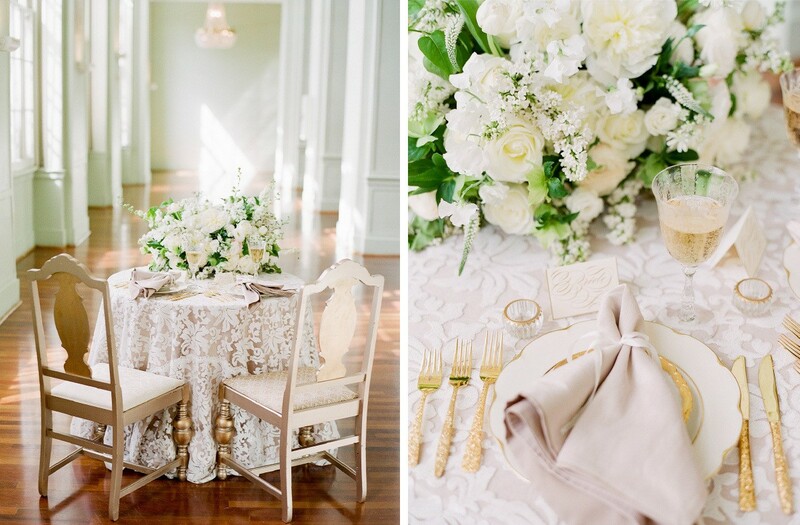 The table was brimming with blooms and anchored by high back chairs in ivory and gold. 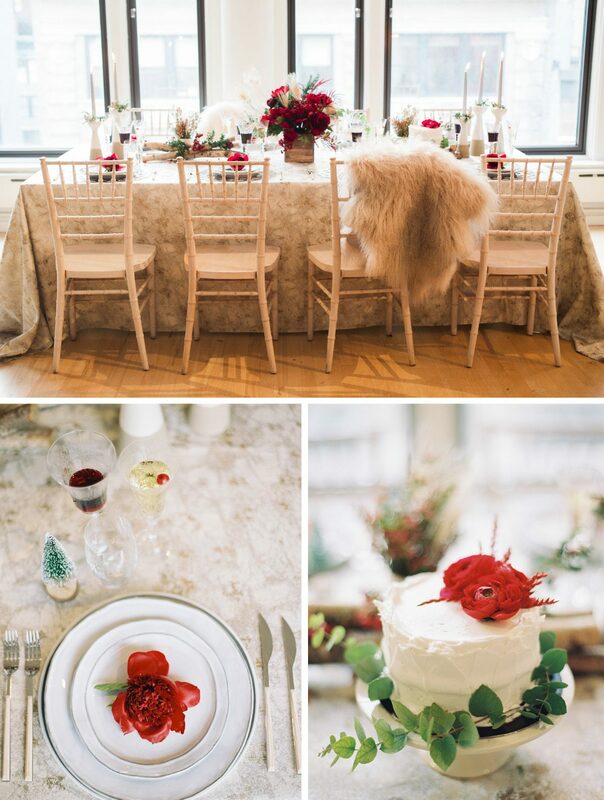 Just the place to celebrate your “I Do’s!” Whether you’re celebrating your winter nuptials this year or working up a fantastic holiday party, this styled shoot should provide plenty of inspiration! We’re so lucky to work in an industry where joy and celebrations are our business. It’s a wonderful reminder to express gratitude daily and as Thanksgiving approaches we wanted to take a pause to share with you some of the things our team is celebrating this year. From travels to beautiful parts of the world to the birth of not one, but two gorgeous baby girls, 2017 has been great to us! With much gratitude to the amazing team who dreamed up this table; it inspires us to share with friends and family at something to beautiful and inviting! We couldn’t have done it without Dori, at The Social Office, who designed and planned this. Thank you to all creative partners! Let’s start with the Biltmore Ballrooms. WOW. 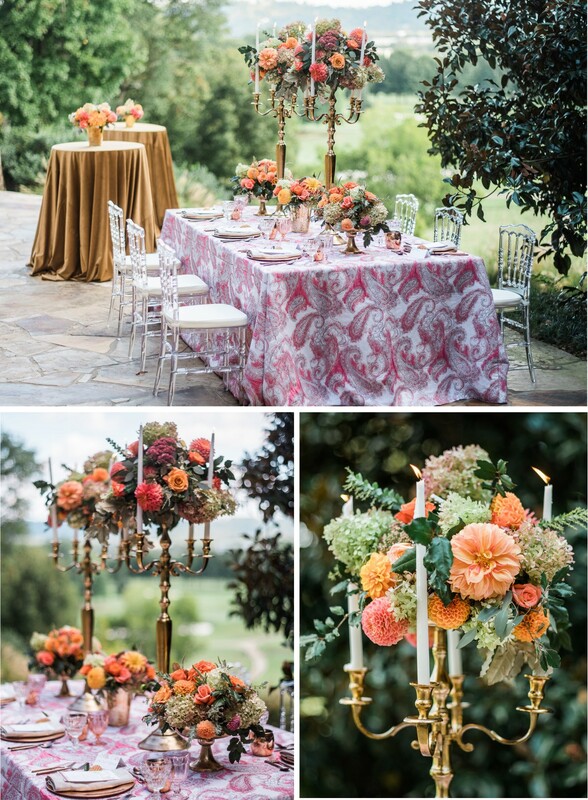 What a perfect setting in Atlanta for this one (no wonder it landed in Southern Weddings v9)! The classic space set the backdrop for an elegant and refined wedding style, made all the more fun with its mint-green walls and sparkling chandeliers. We love how Sawyer Baird captured the natural light filtering through, giving every moment that magic touch. 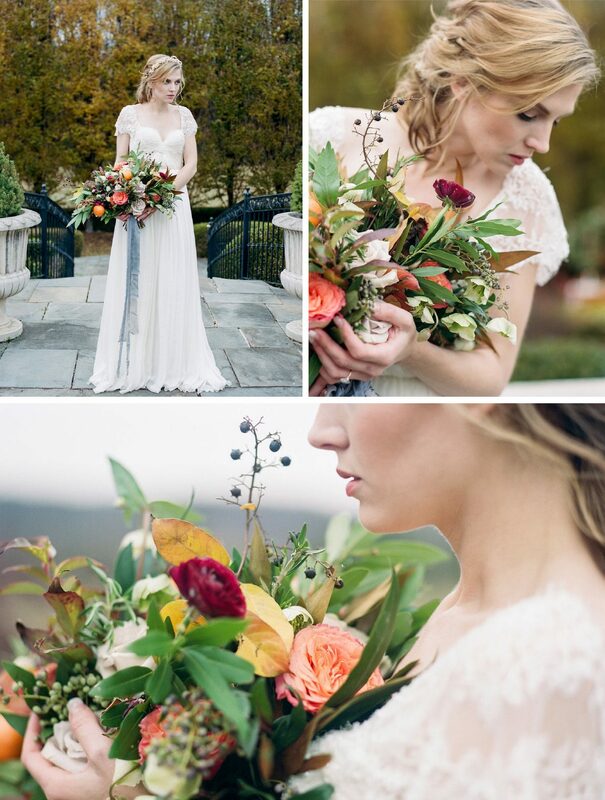 Jacin Fitzgerald not only planned and designed this lovely day but she also arranged the gorgeous florals for the shoot. 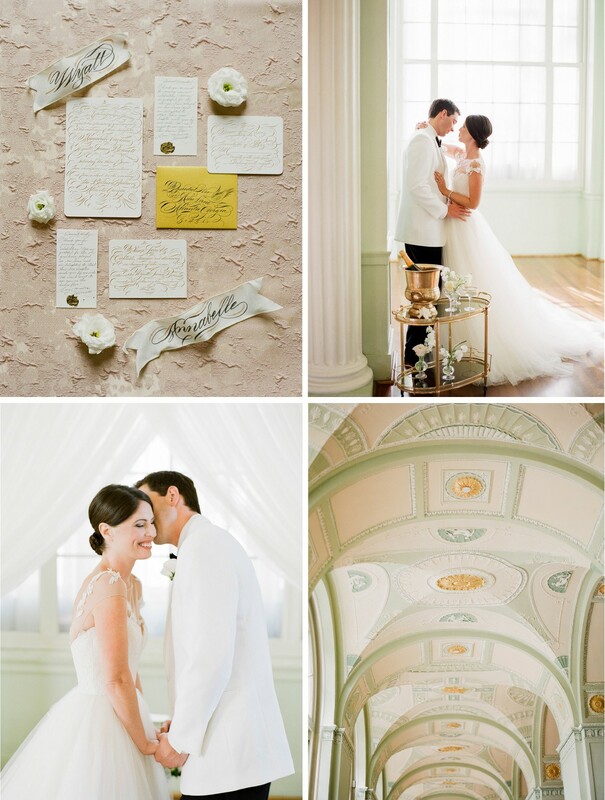 A mix of white and green with tinge of blush, they added just the right touch of greenery. 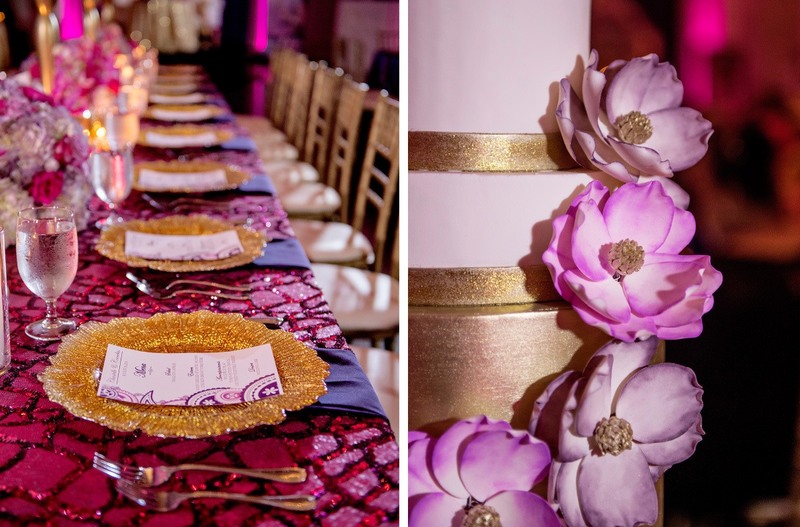 Setting the tables, one for guests and the other for the sweethearts, Jacin Fitzgerald used our Anita linen – in two ways! 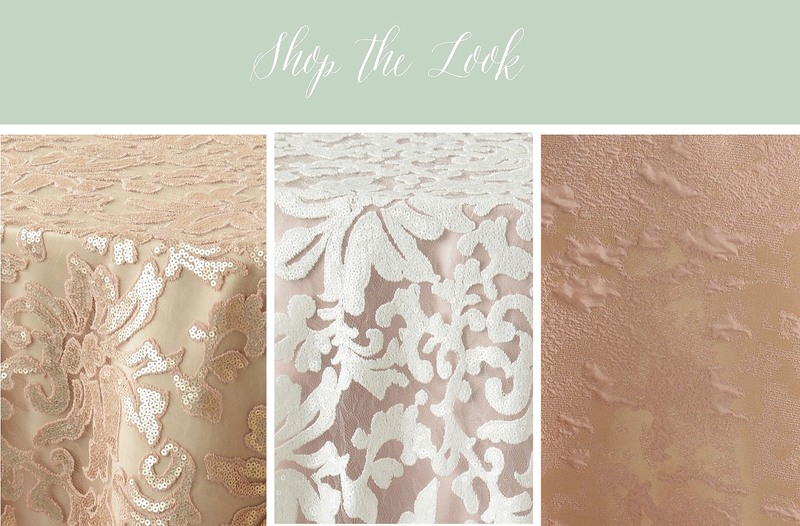 Our White Anita for the couple and our Sultry Beige Anita for guests. 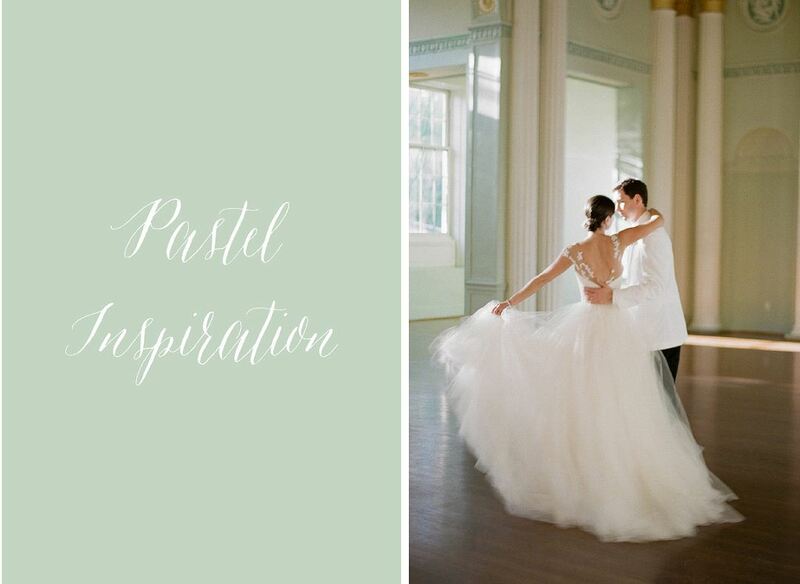 The two styles played right into the color palette while adding a little sequin sparkle. 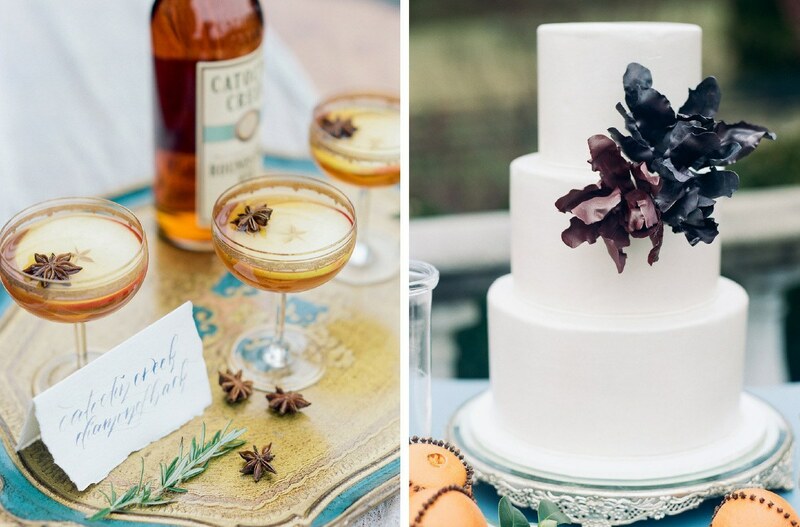 From start to finish, this gorgeous styled shoot is the perfect inspiration for that timeless wedding of your dreams! 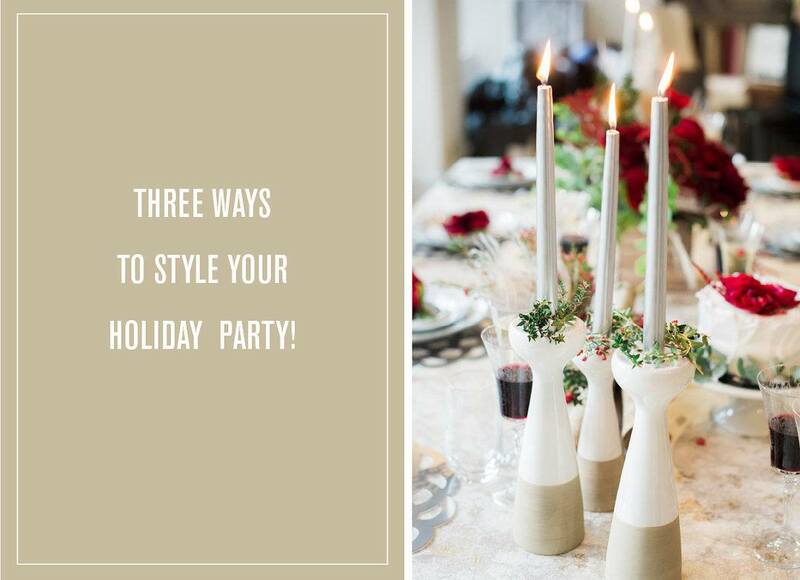 Three Ways to Style your Holiday Party! ‘Tis the season! The holidays are upon us and it’s just a countdown to the New Year from here. 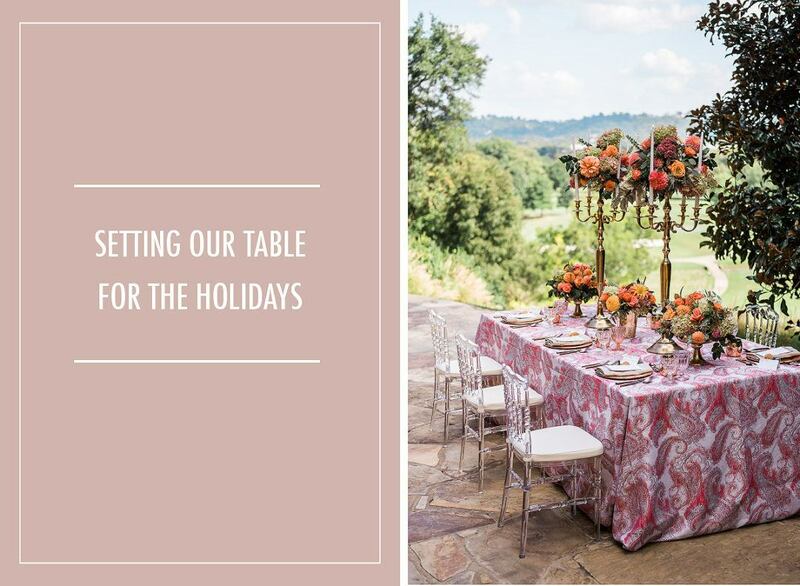 With Thanksgiving around the corner and December holidays right after, are you ready for those seasonal soirees? You know we love the festivities this time of year (remember our lookbook last holiday season?) and are always looking for fun ways to jazz up the party. 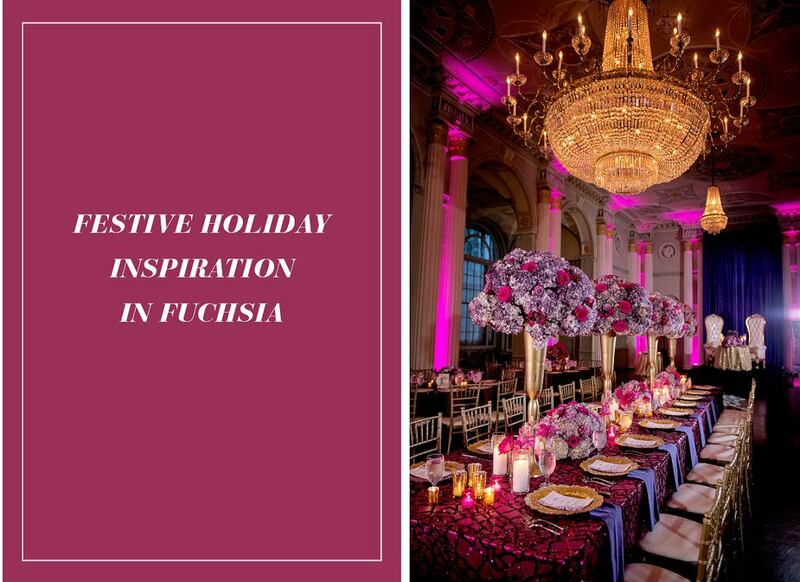 With the help of Sofia Crokos Events and Lifestyle, we have three sophisticated and definitely-not- boring looks to inspire your celebrations this season. So whether you’re hosting Thanksgiving at your place or gearing up to throw a huge corporate event, scroll through to get inspired! 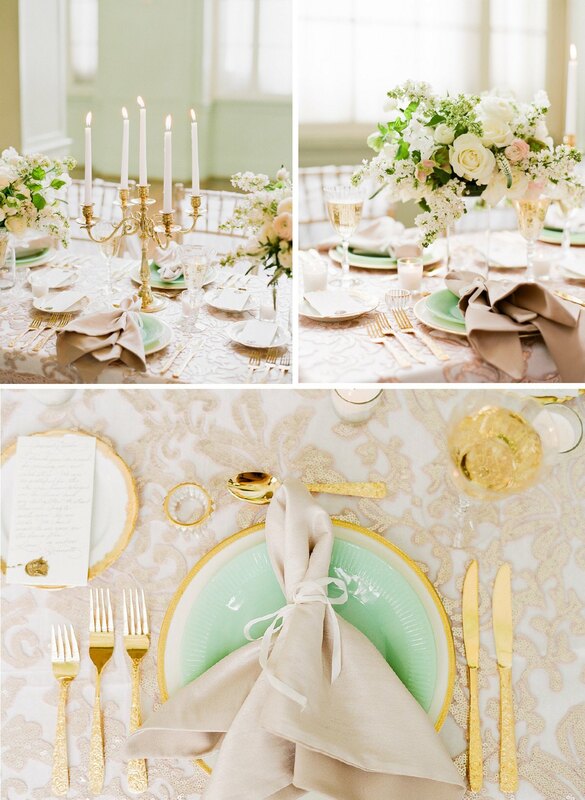 For an intimate dinner, we love how Sofia styled our Champagne Metallic Forest. 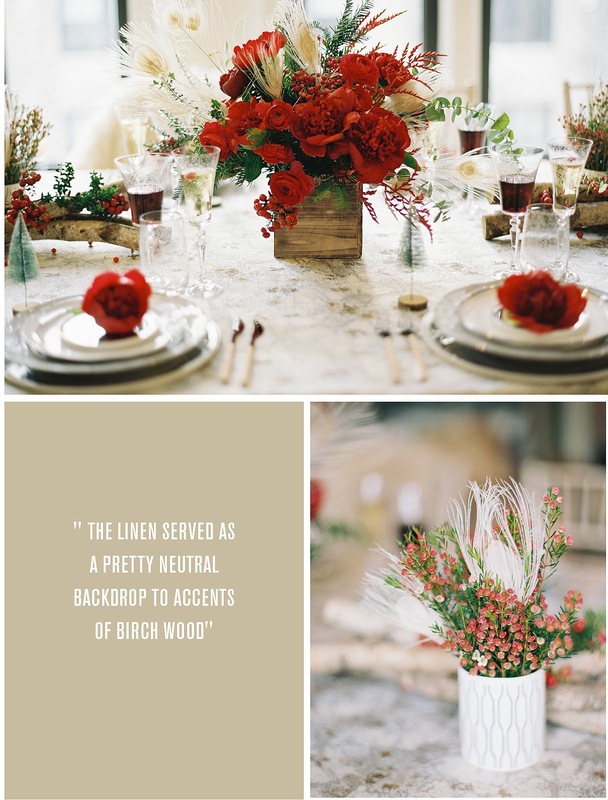 The linen served as a pretty neutral backdrop to accents of birch wood and bright red blooms from Bastille NYC. It has a minimal feel to it without being cold. Those sheepskins really warmed it up! We’re obsessed with the tiny snow-capped pine trees placed around the setting, gives it that surprising touch of fun that Sofia is known for. 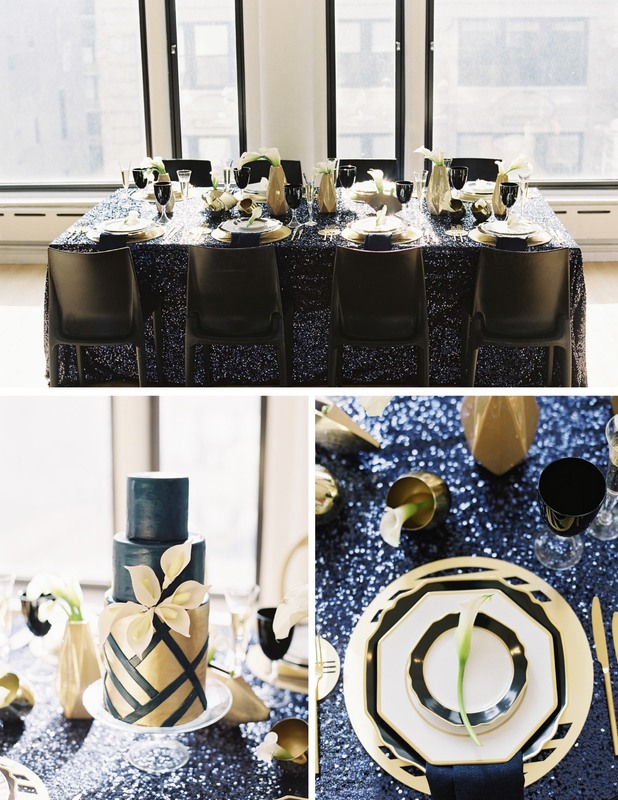 Kicking it up to the next, incredibly chic design, Sofia used our Navy Blue Sequin Taffeta to set the table. 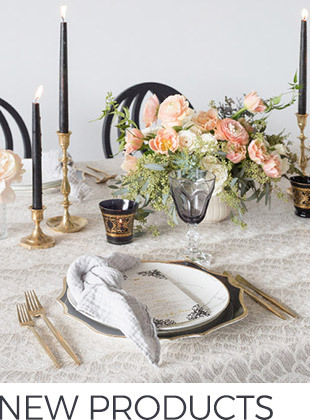 The impossibly elegant combination for black and blue with accents of white and gold is to die for. 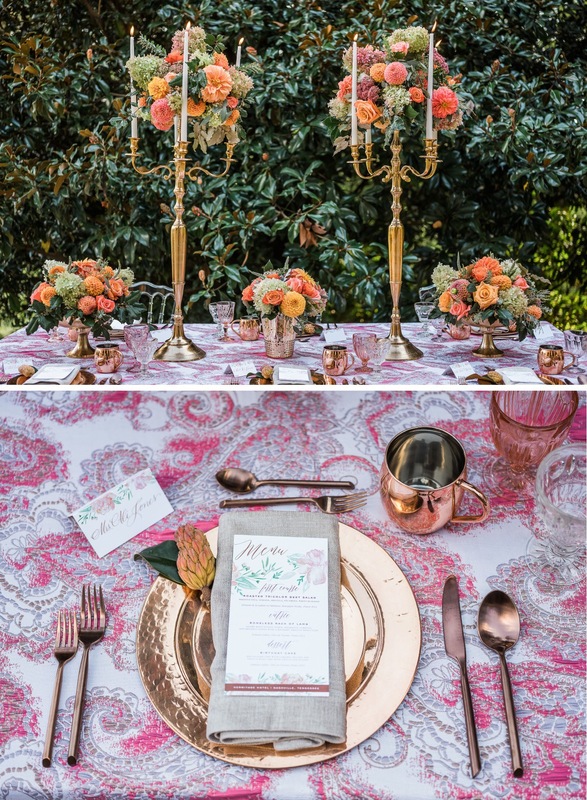 The settings from The Tabletop Company paired with placemats from Red Bliss Design are a match made in heaven! Add to that the unique gold vases for Bastille NYC’s Calla lilies, and the geometric shapes across the setting come together to a beautiful effect. 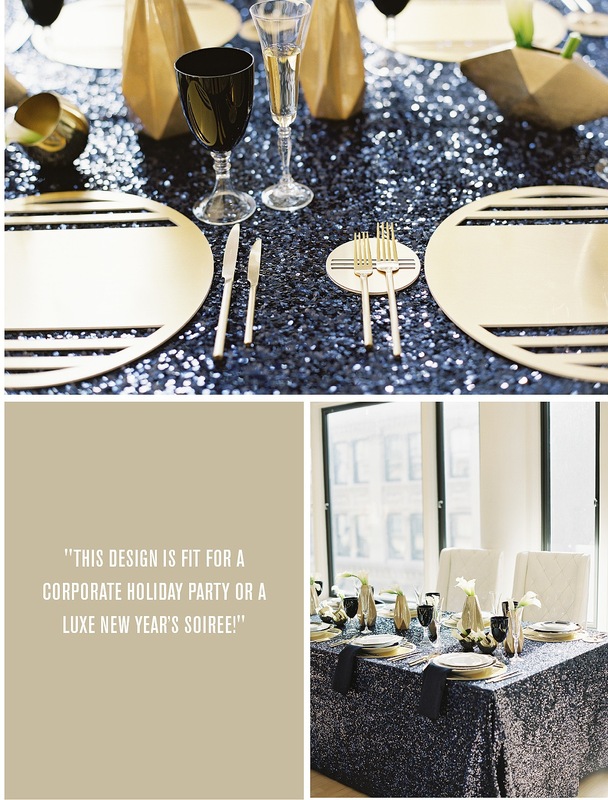 This design is fit for a corporate holiday party or a luxe New Year’s soiree! Taking it back to a traditional winter palette with a twist, Sofia used our Emerald Green Sequin Taffeta to dream up a holiday wonderland! 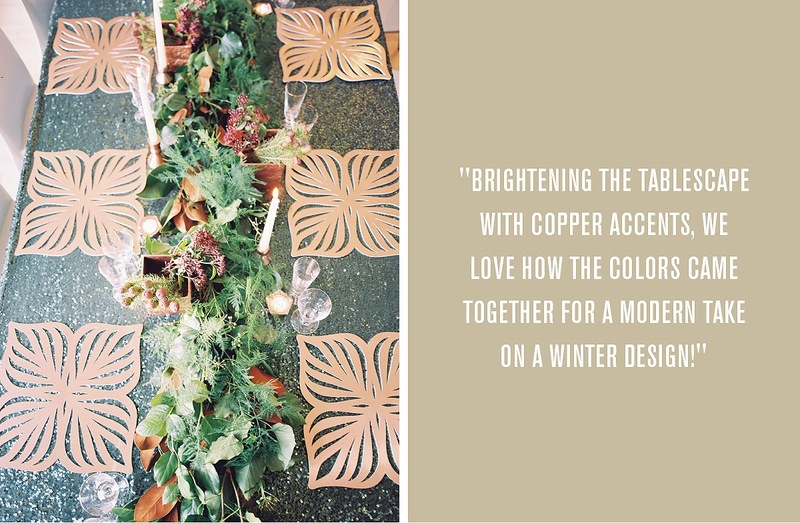 Brightening the tablescape with copper accents, we love how the colors came together for a modern take on a winter design. 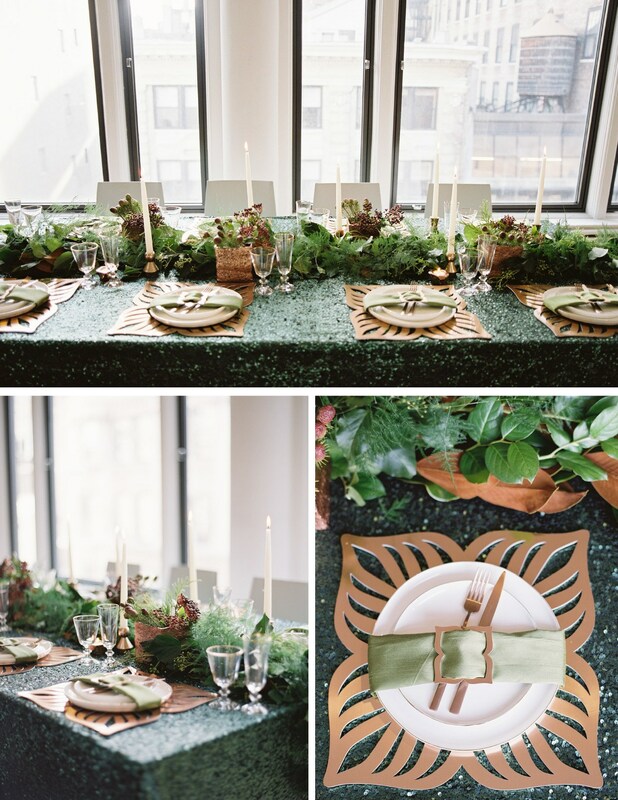 The lush floral runner, brimming with bright greens and rich shades of brown, really set the mood for a holiday fete! And with crisp white tapers, sitting in simple copper holders, the design was transformed to a fresh look! With so many styles to choose from, holiday parties are really a blast! 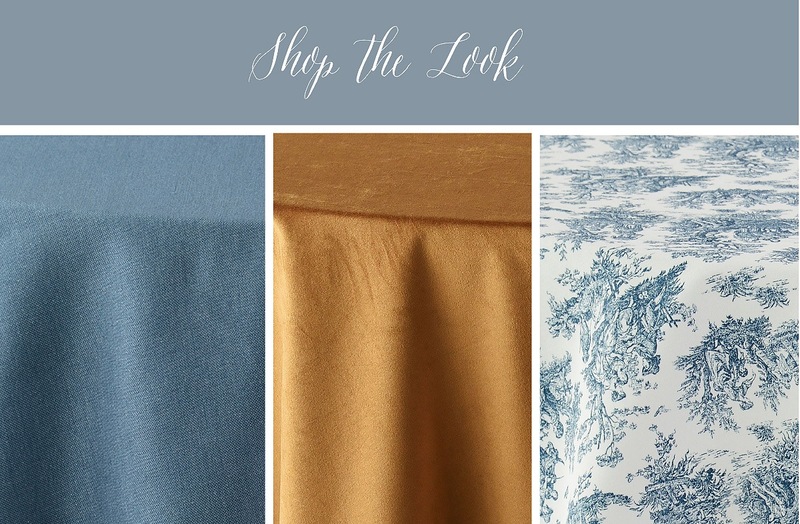 Find your inspiration with these three winter designs (and you can check out some more here too). Here’s to a beautiful season! 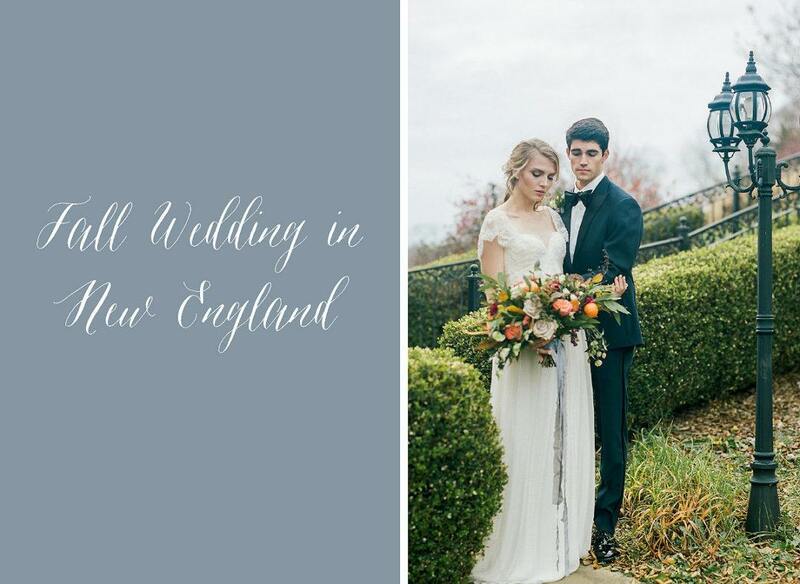 First things first, The Black Horse Inn was the perfect setting for this shoot. Its lovely landscape and ornate detailing could not have been more suited to the concept. We’re in love with the creeping ivy and the wrought iron fence playing backdrop to the couple’s day. 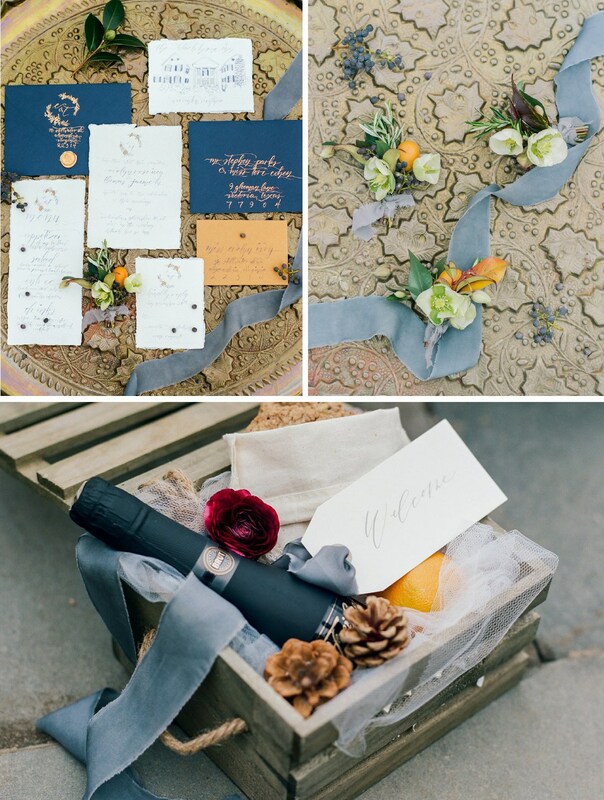 A charming ceremony space, marked by a vintage desk, decorated with a flowing runner and heirloom Bible, and a festive wreath, marked just the spot to exchange eternal vows. The table was set in a French blue hue, using our Sky Western linen, decorated in contrast with florals, from Le Fleur du Jour, in deep fall colors and delicious sprigs of rosemary. The look was both simple and modern, tying in the vintage feel with delicate rentals from Bella Villa Shop, while maintaining a minimalist sensibility on the calligraphy menu cards, from Lady G Paperie. And the couple, the groom looking dashing in The Black Tux and the bride looking ethereal in a Wren Bridal gown, wrapped up the loveliest day with a signature whiskey cocktail, cheers!